After 5 straight hours of Tau painting I've developed a good lump of hard skin on my right ring finger and the Tau tanks on are their way to completion. 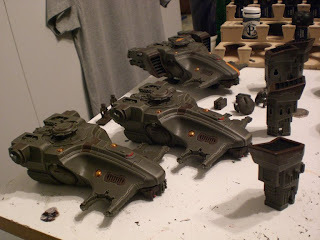 I did all the highlights on the second tank, tidied them up and then did the engine pods for one of the tanks as well. This leaves the second set of engine pods, both sets of smart missile systems and then the orange stripes. The engines pods are surprisingly quick and easy to paint, it's the smart missile systems that take a long time. 5 of 11 hours used. 6 hours remaining. That's an improvement on the last tank, which took 6 hours just to complete the hull. I know I can finish the engine pods and the smart missile systems in the remaining 6 hours, but what about the orange stripes? Good work mate, I've really been enjoying following you this week. I'm sure you can get it done, its just a matter of keeping focused! Cheers mate. Expect batreps and photos from the tournament as well. Vote Results: should he stay or should he go? VOTE: should he stay or should he go?